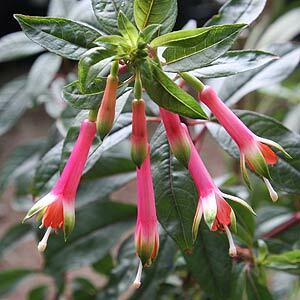 Fuchsia denticulata is a rather rare species, however we have found that it is available for sale in Australia. The flowers are brilliant and add a real glow to the garden, and in a warm climate this is a long flowering species, almost year round. In cooler climates it can be semi deciduous. This is a species that does not like frosts and would require a little protection from hot afternoon sun, it is from the Andes after all. Reaching around 2m although the main flowering time is summer it can put on a few flowers at almost any time. Not really suited to the tropics we think that a humus rich soil well drained and with good filtered light is ideal in Australia. Try digging in some well rotted compost or coir peat to maintain that cool moist root run. It can be pruned back fairly hard to maintain shape if required. And yes it is suitable for growing in a container.